Are 'Green' Cleaning Products Really As Good As They Say They Are? When the house begins to look a little dull and grubby, you know it’s time to take out the brush and shovel and start cleaning. However, many people are turning away from conventional cleaning products in favour of a more environmentally friendly option. 'Green' cleaning products claim to be the safer alternative for all our cleaning needs. However, do they really deserve all of the attention they have received? Let’s find out. In order to budge some difficult stains, a stronger formula is required. The only downside to this is the fact that most conventional cleaning products contain hundreds of harmful chemicals. Even though these chemicals rarely pose any real threat to our health, many people are switching their products for a more 'green' alternative. Some manufacturers have refused to include harmful chemicals in their cleaning products altogether and instead are choosing a more environmentally friendly choice of ingredients. According to Live Science, using conventional or green cleaning products in small amounts will not make you ill. As long as you have used the product correctly and with proper ventilation, you will not be put in harm’s way. This may come as a surprise for many people, who have been living under the impression that all modern cleaning products are harmful. However, with correct use, it seems that there is not much difference between conventional and green cleaning products! Green cleaning products tend to be priced significantly higher than conventional products. According to recent statistics in the area of green household products, four in five consumers are under the impression that eco-friendly products cost a lot more than conventional cleaning products. This is true in many cases, with price tags for green cleaning solutions being leaps and bounds ahead of traditional products. In many cases, you can find the exact same 'green' solution in your own home. When it comes to removing stains with chlorine bleach, many people are worried that their children will accidentally swallow the harmful substance. It is, of course, important to keep products like this well out of your children’s reach. However, you could also use alternative home cleaning remedies, such as white vinegar to tackle those difficult to budge stains around the house. 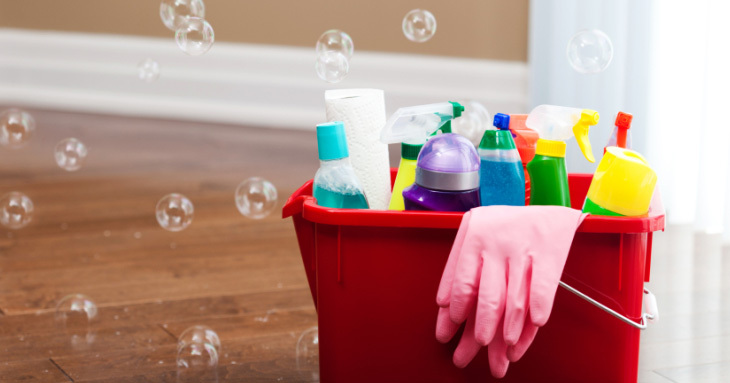 People often dread the thought of cleaning their homes and much of this reluctance is due to the fact that many people just don’t know how to clean. Sure, they can mop a floor and dust the odd shelf or two, but many people don’t know how to tackle difficult stains in the safest and most effective way possible. If this sounds like you, you should perhaps consider seeking help from Molly Maid. Doing so ensures that your house is kept clean and spotless, without you having to worry about which cleaning products to choose and whether or not green really is better. Is this a sponsored post for Molly Maid? True story - balance is the key. But if you clean as much as I do and use conventional cleaners, there probably won't be any skin left on your bones. That's what I like about organic cleaners - there's no need to worry about how often you use them as their ingredients are not toxic.